How are going your last days of 2016 so far? It’s been a strange year? Well let’s not diverge, and focus on ZeMarmot, then, shall we? First be aware that our dear Director, Aryeom Han, is getting a lot better. She was also really happy to get a few “get well” messages and say thanks. Her hand is still aching sometimes, in particular on straining or long activities, but on the whole, she says she can draw fine now. I will discuss below what was done in the last months, but first — because it is customary to do so at end of year — I remind that ZeMarmot is a project relying on the funding by willing individuals and companies, with 2 sides: art and software. 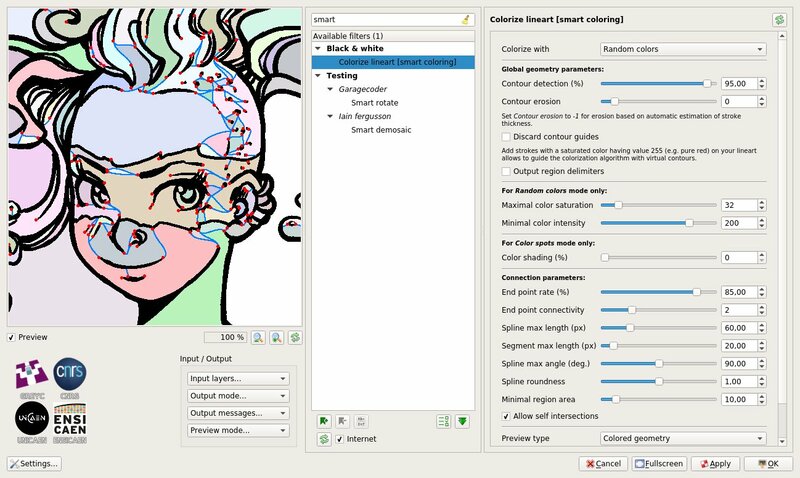 I am a GIMP developer, the second biggest contributor in term of number of commits in the last 4 years and I also develop a plugin for digital 2D animation with GIMP, which Aryeom is using on ZeMarmot. 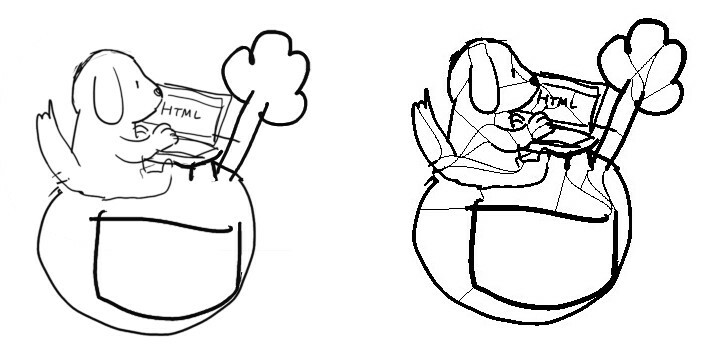 I want to get my plugin to a releasable state by GIMP 2.10. 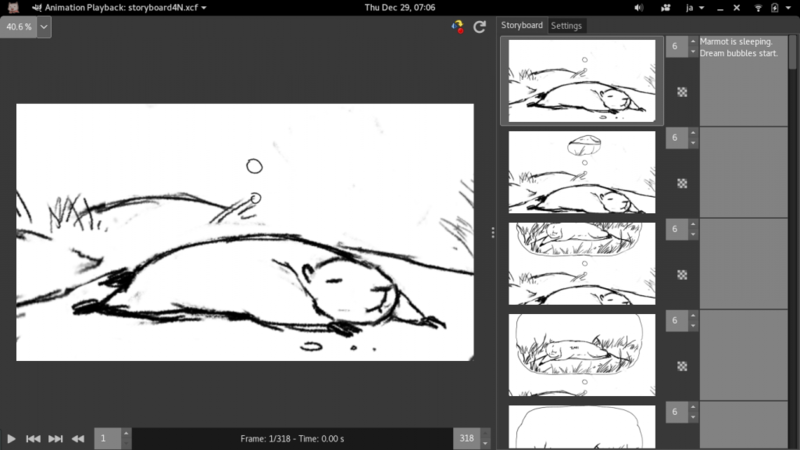 Aryeom is using the software to fully animate, draw and paint a movie, based on an original story which I wrote a few years ago, about a marmot who travels the world for reasons you will know when the film will be released. 🙂 Oh and the movie will be Creative Commons by-SA of course! Up to now, our initial crowdfunding (~ 14 000 €) has allowed to pay several months of salary to Aryeom. I have chosen to not earn anything for the time being (not because I don’t like being paid but because we cannot afford it with current funding). Some of it is remaining but is kept to pay the musicians. Now we are mostly relying on the monthly crowdfunding through the Patreon (USD funding) and Tipeee (EUR funding) platforms. 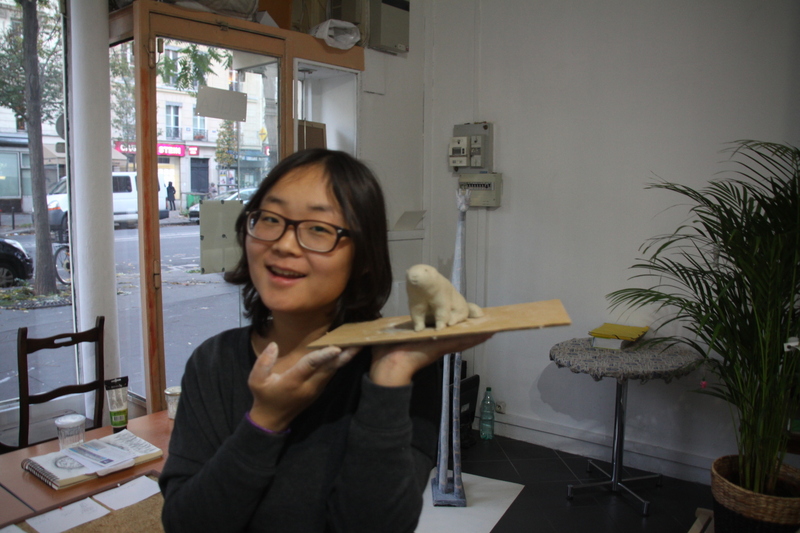 But all combined, that’s about 180 € a month, which amounts to barely more than a day of salary (and with non-wage labour costs, that’s not all of it for Aryeom). 1 day per month to make a movie, that’s far from enough, right? My dream? 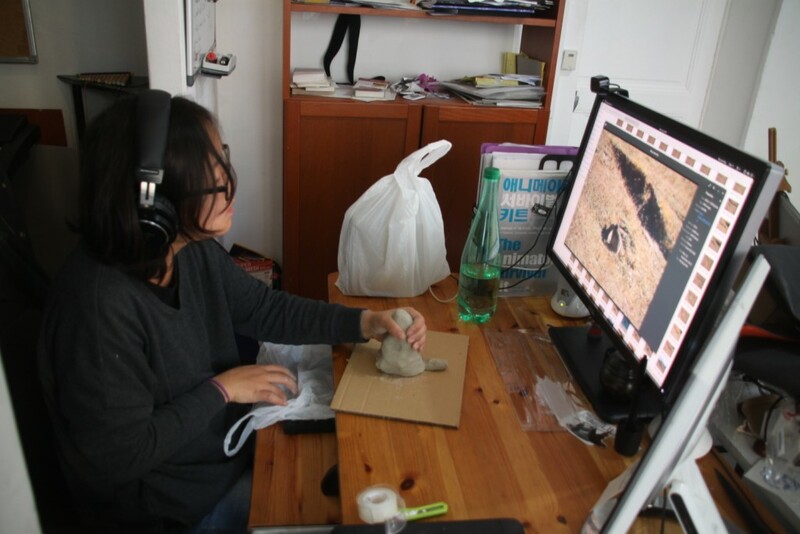 I wish we could some day consider ourselves a real studio, with many paid artists, producing cool Libre Art movies going to the cinema (yes in my crazy dream, Creative Commons by-sa films are on the big screen! ), and developers paid to improve Free Software so that our media-making ecosystem gets even better and for everybody to use! But right now, that’s no more than an experiment mostly done voluntarily. Do you like my dream? Do you want to help us make it real? You can by helping the project financially! It can be the symbolic coin as the bigger donation, any push is actually helping us to make things happen! Not sure yet? Feel free to read more below and to pitch in at any time later on! Note that not only the money but also the number of supporters is of great help since it shows supports to bigger funders; and for us that’s good for morale too! A good monthly crowdfunding can also help us find producers without having to abandon any of the social and idealistic aspects of the project (note that we have already been contacted by a production who were interested by the film after the crowdfunding but we refuse to compromise too much on the ideal). There are a lot which can be said on these few minutes shown about the work of “animator”. Many pages of books on the art of animating life could be filled from such examples! We will probably detail these steps in longer blog posts but I will still explain the basics here. Aryeom says it in the first video and you can see it in several examples in both videos. When your character moves from A to B, you are not just “moving” it. You have to give the impression that the character is acting on oneself, that it is alive, inhabited, in other words: animated. This is no surprise one of the most famous book on animation is called “The illusion of life” (by Frank Thomas and Ollie Johnston), also the bedside book of Aryeom. Going this way has a lot of ramifications on the animator job. Before we continue, I have to make sure I am understood. Even though realistic animation is also a thing (Disney comes to mind), making a good animation is otherwise not necessarily about making it “realistic”, but instead about making it “believable”. It is very common to exaggerate some movements for various reasons (often because it is funnier, but also sometimes because exaggerating it may sometimes look even more believable than the realistic version! ), or the opposite (bypassing anatomically-correct movements). There are no bad reasons, only choices to achieve what you want. Now that this thing is clear, let’s continue. The very classical example beginners will be given is often: “lift your right arm up”. That’s it? Did you only move your arm and the rest of the body stayed unchanged? Of course not. To stay in balance, your body shifted to the left as a counterweight; the right shoulder lifted whereas the left shoulder lowered; and so on. A lot of things will change in your body with this simple action. Even your feet and legs may move to compensate the shift of the center of gravity. As a consequence, you don’t “move your arm”, you “move your whole body” (in a configuration where your arm is up). 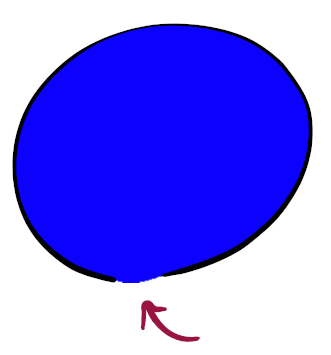 This is one of the first reason why to just move a single part in a body, you cannot reuse previous drawings and change just this part. No, you will properly redraw the whole body because if you are to fake life, you may as well do it well. Note: when you say “animation” to computer people, their brain usually immediately wires to “interpolation“, which is the mathematics to compute (among other things) intermediate positions. Because of what I said above, in reality, this mathematical technique is barely used in traditional (even when digital) animation. It is used a lot more in vector and 3D animation, but its role should definitely be minimized compared to the animator work even on these fields. In vector/3D, I would say that interpolation only replaced the inbetweener role (some kind of “assistant” who draw non-keyframe images) from the traditional animation world. You often hear it from actors, poets, writers, singers, anyone who gives some kind of life: the silence is as important as the noise for their art. Well I would also add the acceleration and the symmetrical deceleration. 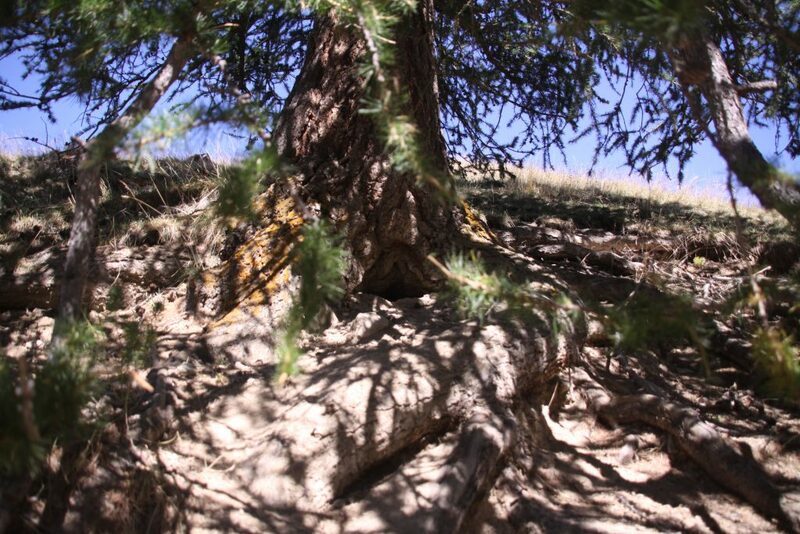 You can see this well on this first example of the video 1 (at 0’41). Aryeom was unhappy with her running marmot which was nearly of linear speed. Marmot arrived too fast on the flower. Well he slowed down, but barely. 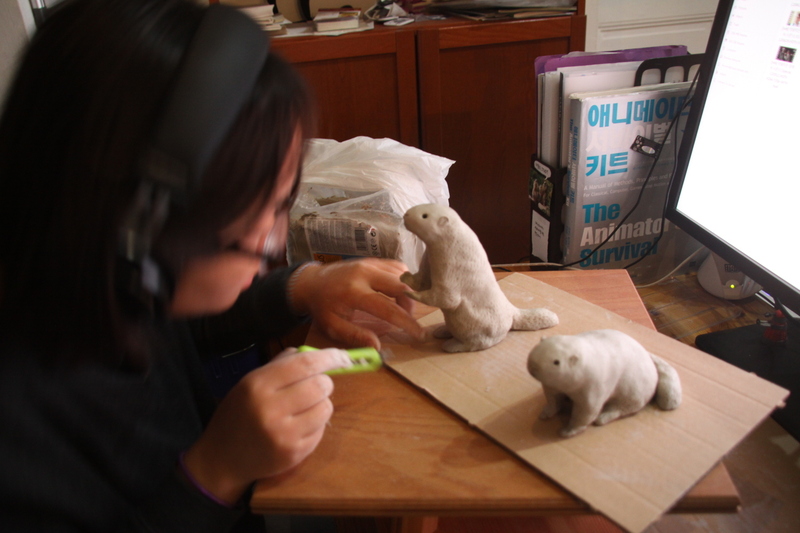 Her finale version, Marmot would arrive much faster with a much more visible slowdown, making the movement more “believable” (we get to the bases!). The eagle flight in video 2 (at 1’09) is another good example of a difficult timing as Aryeom went through 2 stages before finding the right movements. With the wrong timing, her flying eagle feels heavy, like it has difficulty to lift itself into the air (what she called her “sick” eagle in the video); then she got the opposite with an eagle she felt more sparrow-like, too light and easy-lifted. She was quite happy with the last version (obtained after 8 attempts) though, and in particular of this very last bit in the cut, when the eagle gets in glider mode. Can you spot it? 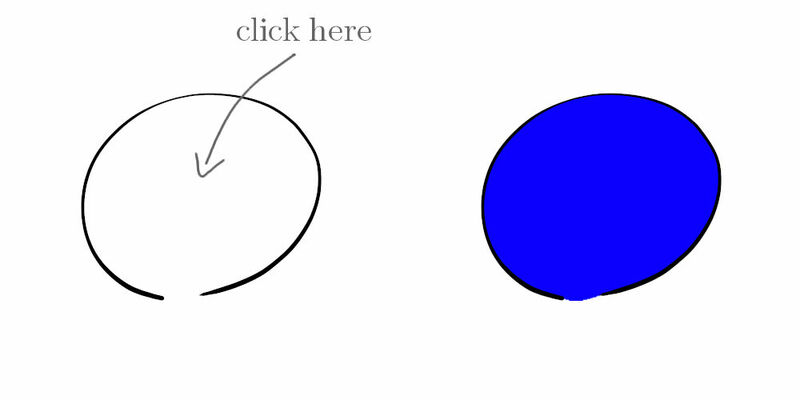 This is the kind of difference which just lasts for a few hundredth of seconds, barely noticed, yet on which an animator can spend a significant amount of time. 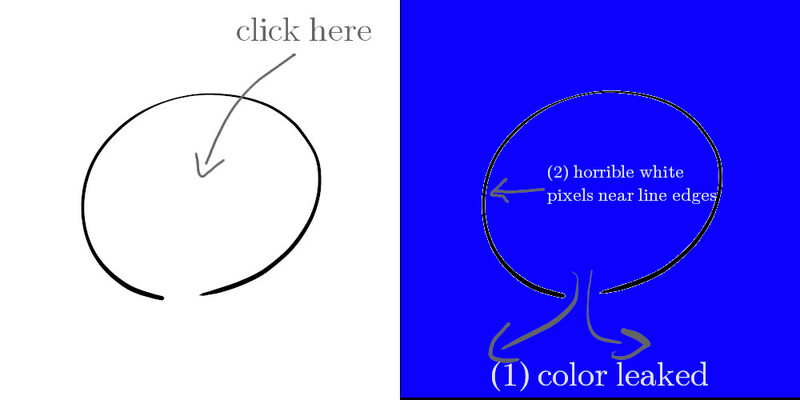 A common and interesting effects you find in a lot of animation is about a shaking still image. You can see it in the second video (at 0’33), first cut presenting the proud eagle still on his mountain. Sometimes you want to show a non-moving situation, but just sticking to a still image feels too weird because in real life, there is no perfect stillness. Even if you make all efforts to stay still for a few seconds, you will imperceptibly move, right? So how do you reproduce this? The attempt to stay perfectly still while this being impossible? Well commonly animators will just redraw the same image several times because as much as you can’t stay still, you can’t draw perfectly identical images twice either (you can get very close by trying hard though) and you loop them. You usually don’t do this for everything. Typically, elements of the background, you accept them to be still much more easily. But this is common for your living character or sometimes to pull main elements which you want to tick out of the background. 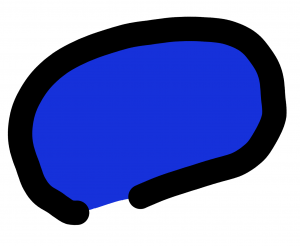 Now, loops are very usual in animation. But the higher quality you aim for, the less you have loops. Same as stillness does not exist in life, you never repeat exactly the same movement twice. So even though loops seems to be the first thing many animators will teach (the famous “walking cycles”), you don’t actually use these in your most beautiful animations. When your main character walks, you will likely re-animate every step. Of course, it is up to you to decide where to stops. Maybe for this flock of birds in the background, far away, just looping (and even copy-pasting the birds to multiply them!) may be enough. Though this is all a matter of taste, time, and money ready to spent on animator-time obviously. 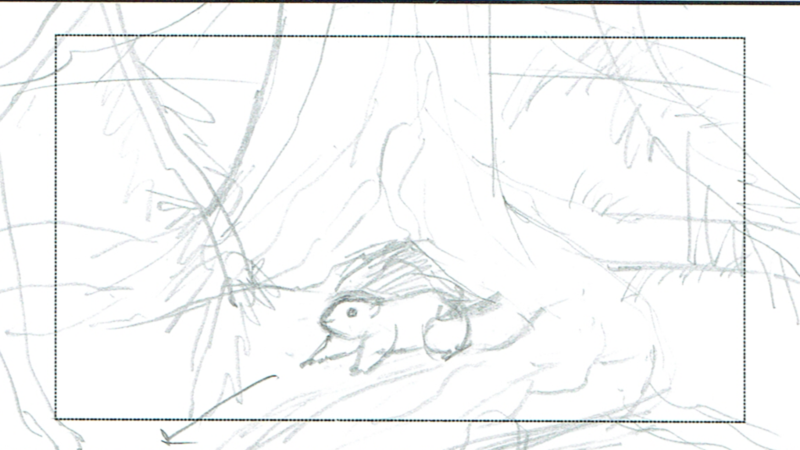 This part has not really started yet, even though it has already been planned (from the storyboard step). But since Aryeom started (first video at 1’06), let’s give some more infos. In animation, where the movement is by essence 2D as well, these refers to respectively a horizontal and vertical camera movement. Why do I need to say “in 2D animation”? Because in more traditional cinema, these will rather correspond to a tracking shot done on rails, whereas panning and tilting refer to angle movements of a static camera. Different definitions for different references. Note that even though 3D animation could be using one or the others, they mostly kept the animation vocabulary. This gives you a good hint on how characters and background are separately managed. If you have a character walking, you will usually create a single image of the background, much bigger than the screen size, and your camera will move on it, along with the character layers. With fully digital animation, this usually means working on image files of much higher sizes than the expected display size; in traditional physically-drawn animations, it means using very large papers (or often even sticking papers together). As an example, at a Ghibli exhibition, they would display the background for a flying cut of “Kiki’s delivery service” and it would take a full wall in a very large room. I will conclude the section on animation by saying: that’s a bloody lot of drawing! Hadn’t I stopped her, she was ready to start over. There are actually several “schools”, and some of them would go for simplicity, shortcut and reusage. Japan is well known for the studio Ghibli which goes the hard way as we do, but this is quite a contradiction in the country industry. 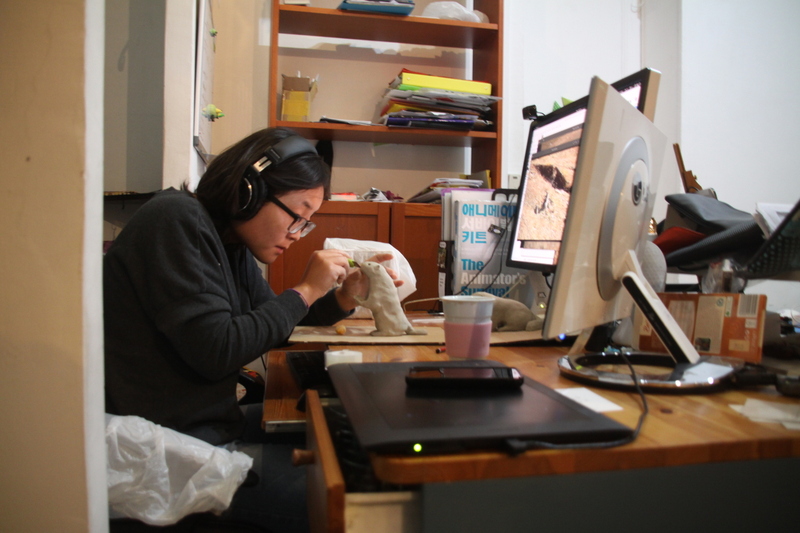 The whole rest of Japan’s animation industry is based on animating as little as possible. Haven’t they proved so many times that it is possible to show a single still image for 30 seconds, add sounds and voices, then call it an animation? 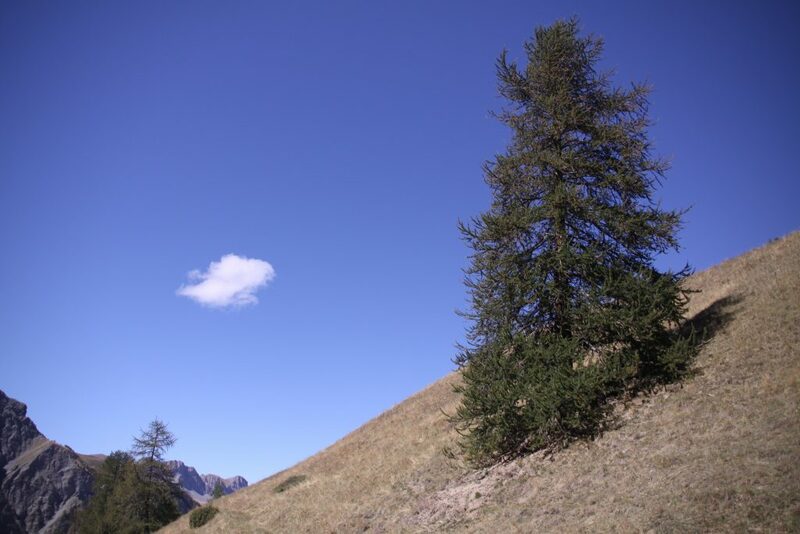 Sometimes it is just a choice or a focus. Some animation films focus on design rather than believable movements, or scenario rather than wonderful images. For instance, I don’t think you can say that The Simpsons has a wonderful graphics appeal and realistic animation (they even regularly makes meta-jokes inside episodes about the quality of their animation! ), but they have the most fantastic scripts, and that’s what makes their success. So in the end, there is no right choice. Every one should just go the way they wish for a given project. And this is the way we are going for ZeMarmot! Just a very short note on music. We have started working with the musicians, remotely and on a physical meeting on December 1st. We have a few extracts of “first ideas” but they won’t do justice to the quality of the work. I think this will have to wait for much later. 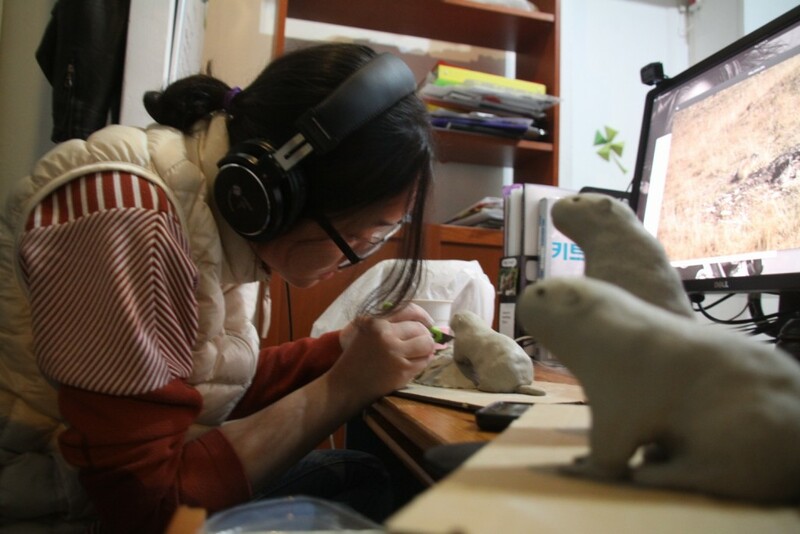 I went so long about animation that I hope I have not lost half of the readers already! If you are still reading, I’ll say what I worked on these last months. I am trying to do my share on GIMP, to improve it globally, speed up the release of 2.10 and because I love GIMP. So I count 259 commit authorship in 2016 (60 in the last 3 months) + 48 as committers only (i.e. I am not the author, but the main reviewer of a patch which I pushed into our codebase). I commented on 352 bug reports in 2016, making it a habit to review patches when possible. I have a lot of projects for GIMP, some of the grander being for instance a plugin management system (to install, uninstall and update them easily from within GIMP, and a backend side for plugin developpers to propose extensions), but also a lot of ideas about the evolution of the GUI (this should be discussed topic-per-topic on later blog posts). Also I have been starting to experiment with Flatpak so that GIMP can provide an official release for GIMP. For years, our official stance has always been to provide a Windows installer, a OSX package, and GNU/Linux… yeah grab the source and compile or use the outdated version from your package manager! I think this situation can be considerably improved with Flatpak and similar technologies which were born these years. As explained already, I took the path of writing it as a plugin rather than a core feature. 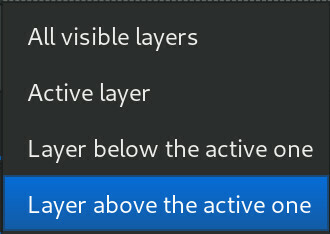 Anyway GIMP is only missing a single feature which would make it nearly as powerful: bi-directional notification (basically currently plugins don’t get notified when pixels are updated, layers are renamed, moved or deleted, images closed…). That’s actually something I’d like to work on (I already have a stash somewhere with WIP code for this). This actually corresponds to the very basic animation logic of 1 layer = 1 frame, which is very common by people making animated GIF (or MNG/WebP now), except with a nice UI to set each image duration (instead of tagging the layer names, a very nasty user experience, feature hidden and found only on some forums or old tutorials), do basic compositing and even comments on vignettes if-need-be. All this with a nice preview in real-time! This is the more powerful view where you can compose a frame from several images, often at least a background and a character. 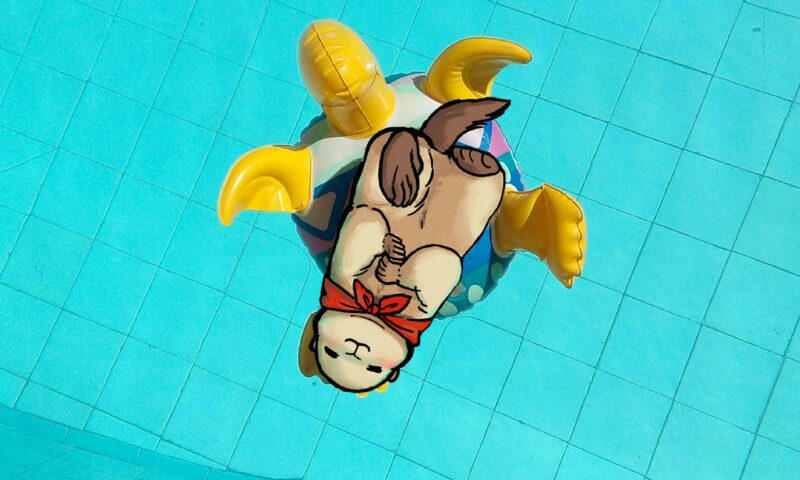 In the above example, the cut is made from 3 elements composed together: the background, the eagle and the marmot. You may usually know more of the “timeline” style of view, which is basically the same thing except that frames are displayed as horizontal tracks. I tried this too, but quickly shifted to this much more traditional view in the animation world, which is usually called an x-sheet (eXposure sheet). I found it much more practical, allowing commenting more easily too, easy scroll, and especially more organized. There is a lot you don’t see in this screenshot, but this view is really targetting a professional and organized workflow. 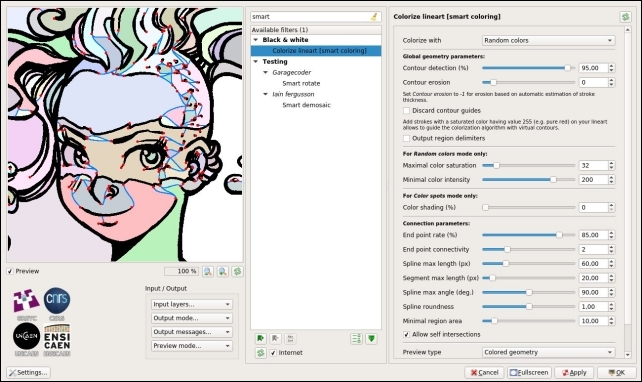 In particular with layers properly named, you can create animation loops and line tests of dozens of images, with various timings, in a few clicks. I am also working on keyframing for effects (using animated GEGL operations) and camera movements. Well there is a lot done but definitely a lot more I am planning to do there, which takes time. I will post more detailed blog posts and will push the code on a branch very soon (probably before Libre Graphics Meeting this year). 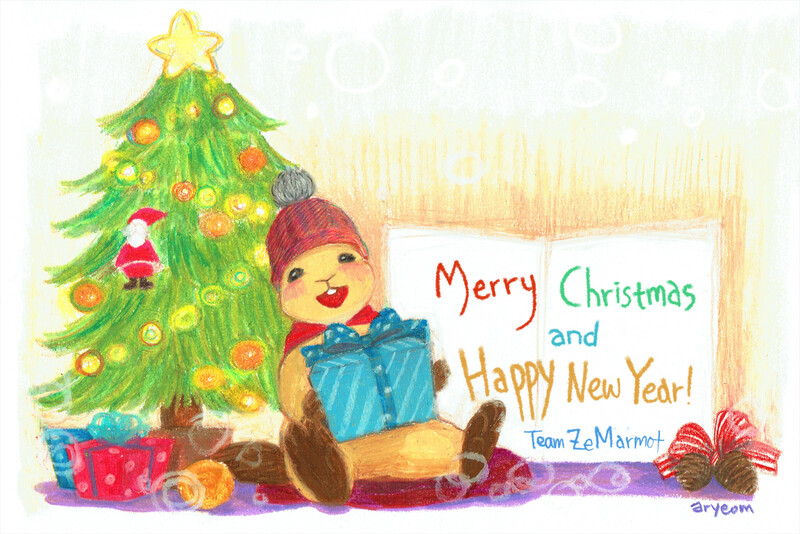 And so that’s it for this end-of year report from ZeMarmot team! I hope you appreciate the project. And if so and can spare the dime (or haven’t done so yet), I remind the project accepts any amount on the links given above. Some people just give 1 Euro, others 15 Euro per month. 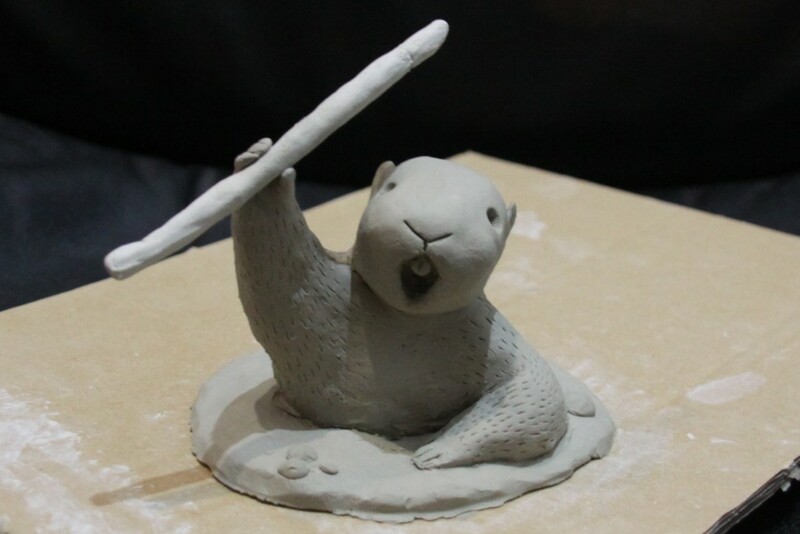 In the end, you are all giving life to ZeMarmot! 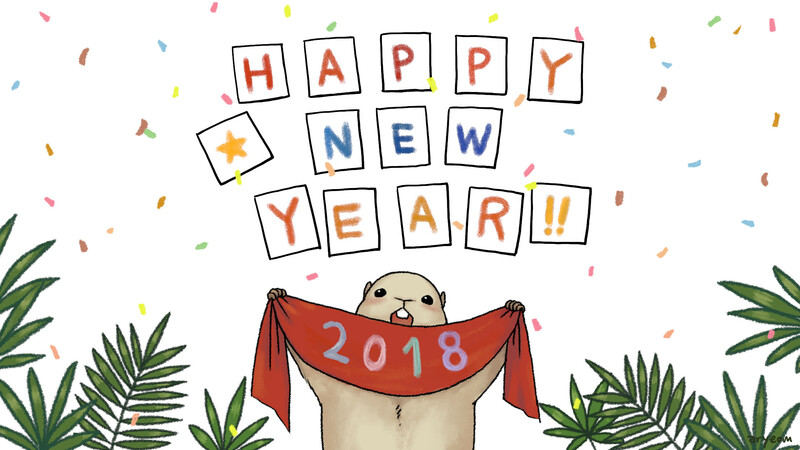 Thanks and have a great year 2017! 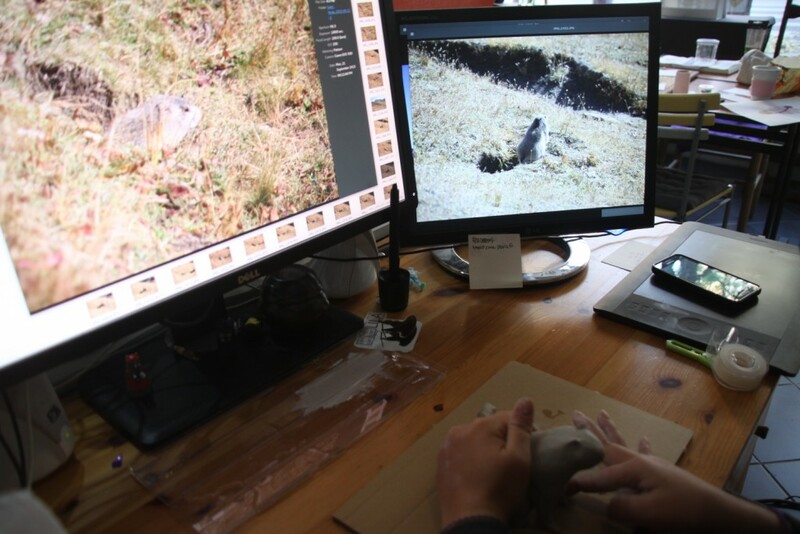 We made the choice from the start about ZeMarmot animation film to not show too much during production process because we don’t want to totally spoil the fun. By the past, I already had the case where I saw a movie animatic before the finale movie, and it really spoiled some fun out of the finale artworks. But since we realize that you’d all would like to see some of what is happening “behind the stage”, here is a small excerpt of our animatic for the pilote (about 30 secs off the first scene). 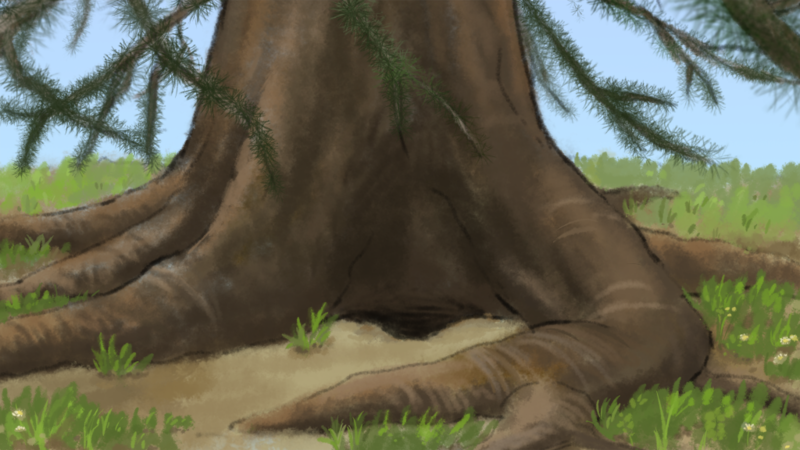 As usually, whatever is digitally-drawn (some parts were pencil-drawn) was done with GIMP. So I think I may have already vaguely told about it. 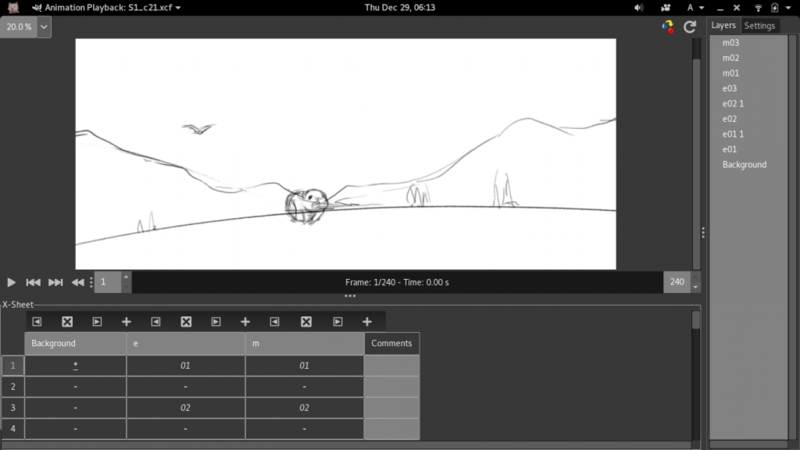 The animatic is basically the next step after the storyboard: you take all the images from the storyboard, and chain them with the right rhythm, as well as basic effects (pans, zooms…) to get a “feeling” of what your finale movie will look like. It still requires some imagination because that’s basically a few static image every second or so. Not enough to be called a proper animation yet! But with the right mindset, this is enough to get an idea and also time your movie! In animation-making, this is also the moment when you freeze your story, the script, the scene and many direction choice. Whereas feature films allow for last second camera or script changes, it would be much more costly in animation films, unless you feel OK asking your painter to redraw several times the same scenes with various perspectives and to throw away days, if not weeks of work. This is why at some point, you need to make choices and try to stick to it as much as possible (last minute changes may always happen, but you always have to weigh the pro and cons). We finished ours around April, and have 2 versions: one without sound, and one heavily commented by myself (in French) for the musicians to get an idea of what they have to work on. We are currently working with them on a few songs. I hope we can soon give you more feedbacks about this particular part of our production too. 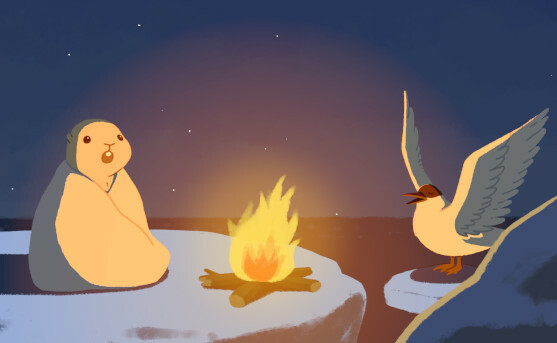 Currently the full animatic for the pilote is about 7 minutes. But this is likely to change slightly. 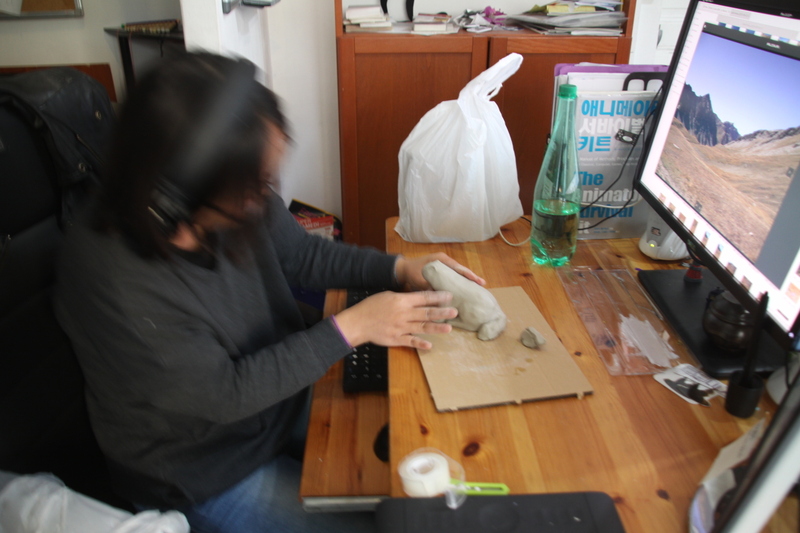 Doing clay (or other suited material) representation of characters, objects or even places is a pretty common tool in animation and film making, before actually making, filming, drawing, 3D-modeling (or whatever technology your film uses) the finale images. Such a technique is done in probably all animation schools and animation studios. Therefore this is not about doing props used in the movie, but really for the movie (i.e. not used on camera, and never seen in the actual film). This is a design tool, or a reference for 3D modelers, painters, animators, actors or directors. As a side note, we saw some cool exhibits of this while visiting Weta studio in New Zealand (a famous studio which does props used in most big Hollywood movies). Amongst other cool stuff, they had this huge fake gorilla — actual size, like more than 2 meters high — in the visitable part of their workshop, which had not been used other than as a reference (I don’t remember which movie, or even if they told us). So you remember when I was saying in an early post that character sheets are used as reference, right? What if instead of a turnaround character sheet, you had your real physical character you could really turn around? 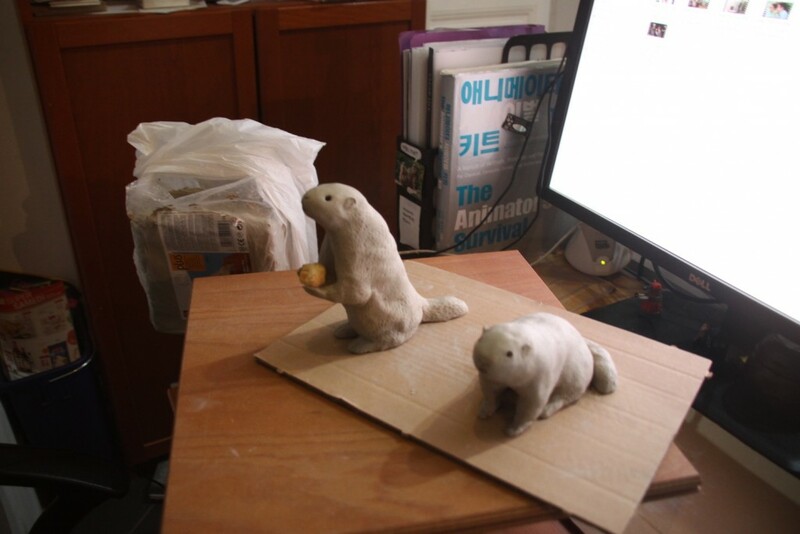 Well we don’t have the real marmot, but we can do clay models. 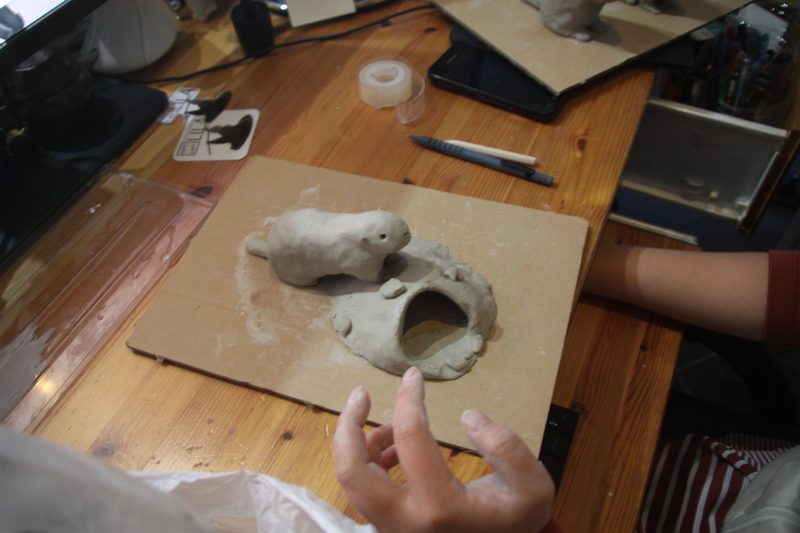 The first marmot is taking shape. A second marmot, up on its feet. The first 2 marmots, side by side. Are they observing the creator in action? 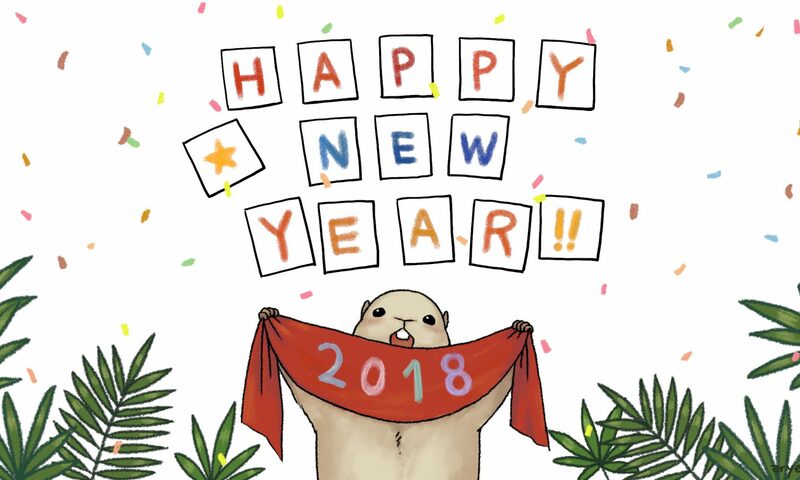 These were actually made back in November, and at the time I only thought of making a small message on @ZeMarmot twitter account in December. Their first usage was helping designing the current version of the main character, by experimenting physically with various shapes. Later they may again be used, as said above for instance for perspective drawing, positioning (or 3D modeling if we ever needed a 3D marmot), and many other cases. publicly visible on March 3. 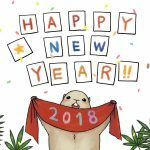 If you like, consider supporting ZeMarmot project on its Patreon page too! portraying Aryeom, under Creative Commons by-sa 4.0 international.